Award winning recipe by Slap Yo Daddy Assistant cook Jeff Hutcherson. 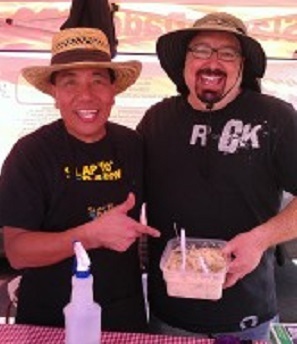 Jeff is well known for his side dishes and helped SYD win an award in the Reeses Potato Salad contest at the Academy of Country Music BBQ Throwdown in Vegas in 2012. Many of the 100+ teams submitted their potato entry and Jeff’s entry was awarded 4th place. It’s easy to make and is delicious. The secret is the sweet pickle juice. 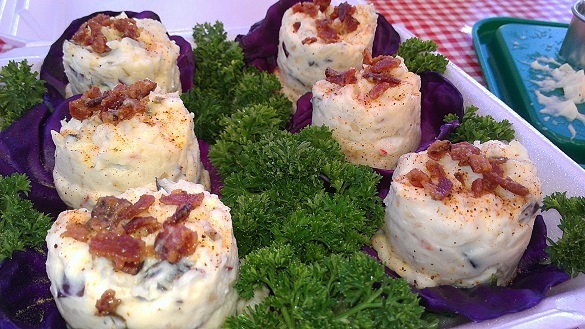 Try this recipe to accompany your BBQ meats at your next party. It’s a winner! Quarter potato’s and add to pot of salted water boiling until fork tender. At the same time hard boil 5 eggs. Drain potato’s and place eggs in cold water to stop cooking. Add drained potato’s to large bowl and place peeled eggs on top. With a sharp knife slice though eggs in crisscross pattern, allowing knife to cut through large chunks of potato’s too, until eggs are diced. Add mayonnaise, salt, pepper and sweet pickle relish and mix until just combined. Add pickle juice, vinegar and olives and mix. Salt and pepper to taste. Sprinkle with paprika, bacon, chopped chives for garnish. I registered for this website because I feel as though I need to thank you. 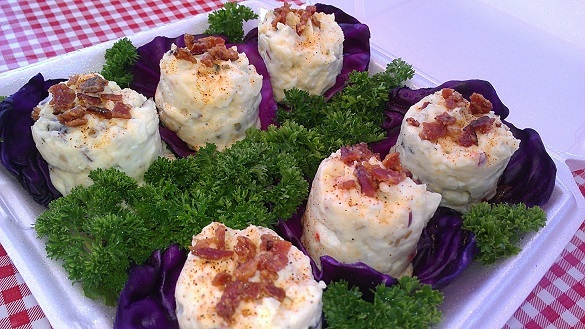 The award winning country potato salad is the best that I have ever had. I have made it numerous times and now I am being invited to cookouts just so that I will make it. Haha! Every holiday and birthday celebration I am asked to make this. I was never a big fan of potato salad but I find myself craving this from time to time. So THANK YOU!!!!!!!!!!!!!!! Keep spreading potato salad love my friend! What kind of potatoes are best ?? I like Yukon Gold. Good luck! It turned out Great !! what kind of olives? and what happens if i use red unpeeled potatoes? I used regular black olives. You can use red potatoes. That should work. Good luck! I made this potato salad and everyone loved it. It is now my favorite potato salad recipe.